You love how versatile the chisel shape is, now you can quickly and perfectly cut chisel shapes for your own creative, colorful quilt layouts. Specially designed corners aid in sewing alignment and eliminate dog ears! Use GO! dies with your GO! and GO! Baby Fabric Cutters to cut precise, accurate shapes in just seconds. Storage: Organize GO! dies with AccuQuilt GO! Die Storage Rack (55115). Care & Maintenance: Use adhesive roller to clean lint and thread from dies. After each use, with the die pick provided with the cutter, remove any threads imbedded between blades and foam. It's normal for threads to get caught where blades meet in a die. Remove with tweezers or die pick. Die blades never need to be sharpened. With some fabrics, after cutting, a thread or two will remain where die blades meet. Snip threads with scissors. Use cutting mats that matches size of each die. For best results, cut with die blades running under roller at an angle. Do not cut with blades parallel to roller. Blades on some dies are positioned at an angle. Align fabric to edge of shape, not edge of die board. Some dies feature specially designed corners to aid in alignment and pre-cutting. 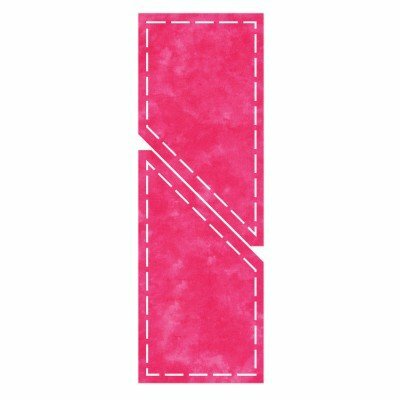 For fast applique, apply fusible web to fabrics, then cut shapes with dies. Use good quality fabric to reduce fabric stretch. It's always a good idea to test cut one shape before cutting many shapes to ensure fabric orientation is correct. Warranty: AccuQuilt GO! dies are guaranteed for one year.